In what’s become an iconic photo representative of the 1913 Reunion, a Union and a Confederate veteran join hands across the stone wall at the High Water mark. Photo Courtesy: Adams County Historical Society. During the past two weeks in Gettysburg, the constant question was, “Did you hear thunder, or was that just another cannon going off?” Between June 28 and July 7, it was hard to tell the difference. Our “most famous small town in America” played host to hundreds of events commemorating the 150th anniversary of the Civil War battle, including two battle reenactments, plus grand and glorious National Park Service ceremonies and events..
Gettysburg is a place forever stitched into the fabric of American history. The seams are deep and strong. The first stitches at Gettysburg, 150 years ago, were searing and painful. The Battle of Gettysburg was the bloodiest conflict of the Civil War, resulting in 51,000 casualties. Slowly through the years, the stitches turned into healing sutures. Veterans returned to Gettysburg’s battlefields, and the public was drawn to its hallowed grounds. Informal gatherings became organized commemorations on milestone anniversaries of the battle. And America’s historical tapestry became interwoven with the profound words of presidents and others who visited this small Pennsylvania town, seeking to make sense of the events of July 1-3, 1863. As early as 1888, commemorations and anniversaries established Gettysburg’s legacy as an iconic American symbol of war and peace, dissension and understanding. It is history in the making, as we witness the 150th anniversary of the Battle of Gettysburg this summer. What continues to draw visitors to Gettysburg, 150 years later? How have past anniversaries been observed? When considering these questions, two main themes evolve—visitors seem to be searching primarily for peace and understanding. The first anniversaries served as reunions, organized mainly for the benefit of Civil War veterans, according to John Heiser, historian for the Gettysburg National Military Park. In 1888, 25 years after the battle, many soldiers returned to witness the dedication of regimental monuments. According to a July 1 Philadelphia newspaper, 35,000 men camped on the battlefield. Signs of peace and reconciliation were evident;Confederate Gen. James Longstreet was a featured speaker at Gettysburg’s reunion. According to newspaper accounts, he was given a “rousing reception.” His speech began, “I was not in time to witness any part of the engagement of the first day of Gettysburg, but am pleased to be here in time to witness these ceremonies and to express that sympathy that should go out from all hearts to those who know how to appreciate the conduct of soldiers who offer their lives on the altar of their country.” Healing was underway, but the Civil War’s voices and stories were disappearing. Longstreet died in 1904. Behind the scenes, organizers had their hands full. A report by the 50th Anniversary PA Commission details crowded conditions in town. Vast amounts of supplies were gathered and personnel assembled, including an army of more than 2,000 cooks and bakers, and hundreds of volunteers from the Boy Scouts, Red Cross and additional organizations. Tragically, nine veterans, returning to the very battlefield where they survived fierce fighting, died during the reunion. The idea of being “enemies no longer” is played out in numerous photos showing soldiers from both sides of the war warmly embracing and shaking hands against the backdrop of the battlefield where they once fought. “You might think,” Heiser says, “‘Why would they want to go back where they had lost comrades?’ But it was the highlight of their lives in a way. These were men who were farmers and from regular walks of life. But as veterans, they were recognized by the federal government for their service. “Never before and not since has a place hosted such a gathering of people who had been enemies,” explains Heiser. “The veterans were curious about their enemies—they all had a mutual understanding of the horrors of war and its effects. Any animosity seemed to dissipate, and they decided they needed a memorial to symbolize peace.” Work began on the Eternal Peace Light Memorial in 1935, just in time for the next milestone anniversary. 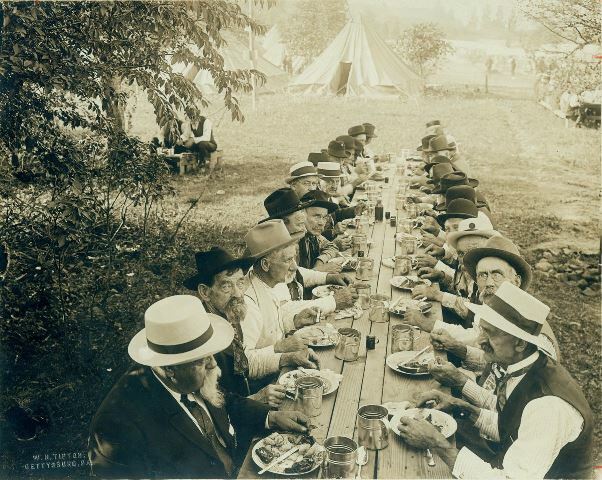 Veterans break bread together in this iconic 1913 photo taken by Reunion photographer W.H. Tipton. Photo Courtesy: Adams County Historical Society. Editor of the Gettysburg Times and Executive Secretary of the PA State Commission for the 75th Anniversary, Paul Roy was a driving force behind ensuring the veterans had one last hurrah. The commission’s report describes “the largest parade ever held in Gettysburg” during the afternoon of Saturday, July 2, 1938. By July 3, the town swelled to more than 450,000 people—“the largest crowd ever assembled in Gettysburg.” They are drawn to the dedication and presentation of the Eternal Light Peace Memorial. According to Neely, the popular sentiment was that “Everyone fought bravely for their side,” without discussing the war’s underlying motives. That sentiment was about to shift. 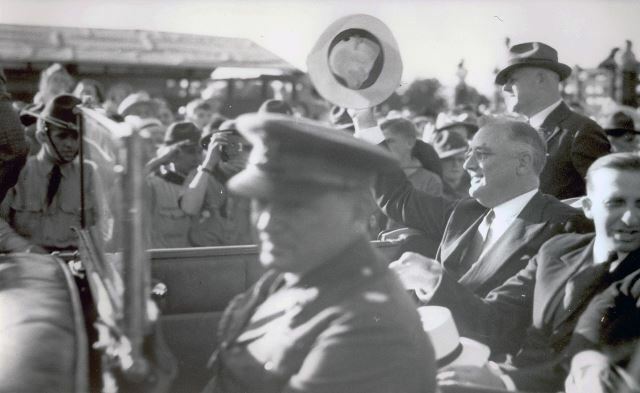 President Franklin D. Roosevelt arrives in Gettysburg to dedicate the Eternal Peace Light Memorial in 1938. Photo Courtesy: Adams County Historical Society. By the 100th anniversary, Americans started to talk about the cause of the war, Neely explains. “You can’t ignore it; we were in the midst of the Civil Rights Movement. People started thinking about their own connections to the war. If they had an ancestor who fought, they thought about their motivation to fight. Was that ancestor fighting for states’ rights or slavery or unification? We’re still arguing about this today. The truth is, the American Civil War ended the legal institution of slavery but cemented the idea of a union, or unification of the states. During this time of social turmoil, the National Park Service also came under fire for holding a reenactment, “playing war,” on the Manassas Battlefield, Heiser says. The National Park Service at Gettysburg decided to present living history skits that helped visitors understand how the battle had changed the country. After 100 years, perspective was gained. 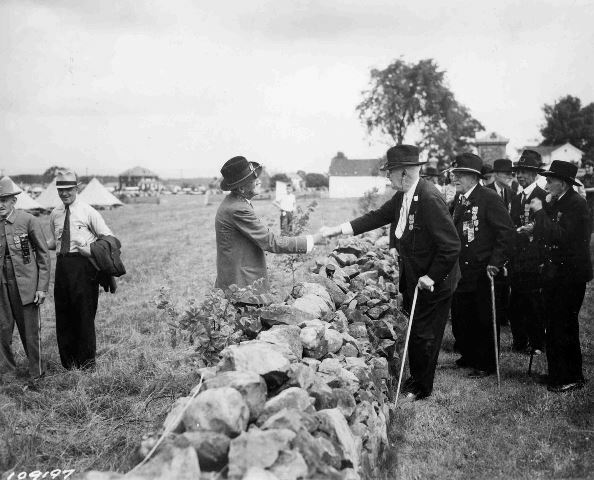 And again, there was a presidential presence—General Dwight D. Eisenhower, a resident of Gettysburg at the time, served as Honorary Chairman of the Gettysburg Centennial Commission. The town capitalized on its visitors, “taking advantage of tourists,” says Heiser. “That was the prevailing thought because hotels upped their prices and people were selling bullets and other items.” One of the most popular items? Little blue kepi, reproductions of the hat Union soldiers wore. Milestone anniversaries had shifted focus, from veterans’ reunions to commemorations designed to educate a new generation of Americans about their nation’s history. The highlight of the 125th anniversary was the rededication of the Peace Light featuring astronomer Carl Sagan, although Heiser admits an even larger crowd attended a battle reenactment held on private property. To see the article as published in Celebrate Gettysburg, with additional photos from past Gettysburg commemorations, click here. This entry was posted in Freelance Writing and tagged Abraham Lincoln, Battle of Gettysburg anniversary, Civil War 150, Gettysburg Address, Gettysburg National Military Park, July 1863, Karen Hendricks, peace and understanding, President Franklin D Roosevelt, reflecting on causes of the Civil War, Reunion of the Blue and Gray, Sesquicentennial by Karen Hendricks. Bookmark the permalink.